Nigeria international Emem Eduok netted his first goal in two months as Kasımpaşa thrashed 2 Lig side Niğde Belediyespor 5-1 in the Turkish Cup on Tuesday. 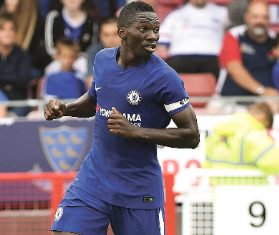 With an eye on the upcoming Super Lig fixture against this season's surprise package Göztepe, manager Kemal özdeş opted to rest Kenneth Omeruo, though the Chelsea loanee watched proceedings from the bench. Niğde Belediyespor were 1-0 up at the interval thanks to Ali Akburc's 36th minute strike but they totally crumbled in the second half. Trezeguet equalized for Kasımpaşa on 57 minutes, Ahmed Ildiz made it 2-1, before strikes from Ali Gocmen and Eduok gave them a three-goal advantage. Niğde Belediyespor's misery was compounded in the 80th minute when Trezeguet netted his second goal of the game. Prior to today's fixture at Recep Tayyip Erdoğan Stadyumu (İstanbul), Eduok had not scored for Kasimpasa since the opening day of the Turkish Super Lig season, when he struck against Alanyaspor. This term, Omeruo has recorded five appearances for the Apaches, all of them coming in the Turkish top-flight.